continues through Sat., Nov. 22. The Trojan Women is a classic palimpsest: re-written, re-adapted and re-translated since 451 BCE, when Euripides copped the story from Homer's even-more-ancient Iliad. 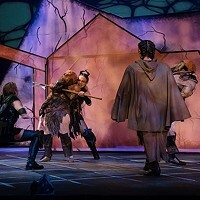 The School of Drama at Carnegie Mellon University's latest iteration, Charles L. Mee's Trojan Women: A Love Story, draws from several thousand years of literature and the horrors of war, with distinctly modern accents. Direct antecedents of the work (a.k.a. 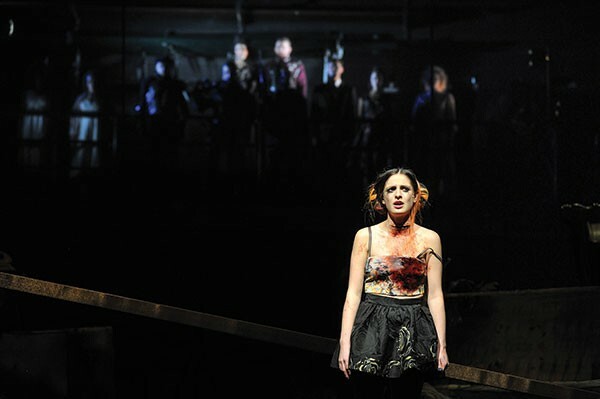 The Trojan Women 2.0) draw from both the Greek tragedy and Hector Berlioz' 1856-58 opera, Les Troyens. 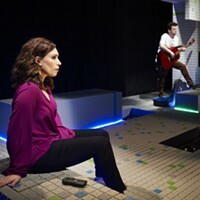 Add more text from James Bannister's 1781 translation, with further massage by adapters Megan Monaghan Rivas and Kate Robinson, then distill with the political/dramatic voice of director Jed Allen Harris. 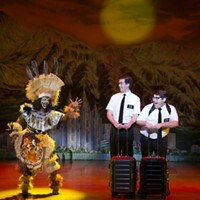 What follows is a one-act spectacle of declamations, pain and very occasional humor. Lex Gernon's set presents a literally skewed vision of the destruction of a civilization in the aftermath of war. DeLisle Merrill's costumes delineate the women before they speak a single word: the gartered vamp Helen, the girlishly innocent Polyxena, the "mad housewife" party dress for Andromache, the ripped and tortured Cassandra. Hecuba herself calls to mind Star Trek's Deanna Troi (yes). After opening Trojan Women as a very classical-style Greek chorus in drag, men are definitely relegated to supporting — and often confusing — roles. The actresses do not merely shine, but are metaphorically on fire. Madeline Wolf sings and slithers her portrayal of the doomed seeress' rage, after Colleen Pulawski channels a demented Doris Day/June Cleaver clone with hidden sexual perversions. Olivia Lemmon certainly commands her matriarchal character in a most demanding role. The often anonymous "Greek chorus" comes to life when the maid, matron, crone types are "interviewed" on video to reveal modern characters and very individual personalities. Respectively, Joell Weil, Kelsey Carthew and Annie Yokom credibly transform from downtrodden slaves to high school student, stay-at-home mother and sophisticated landscape architect to put real faces on war. There's no subtlety in Trojan Women: A Love Story. All the dials are up to 11, and while unmistakably loud, it is often less clear.